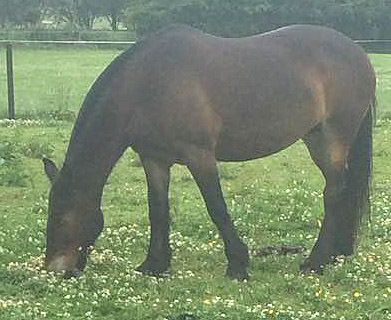 “I bought Haze, my 13 year old native type mare, in August 2015. 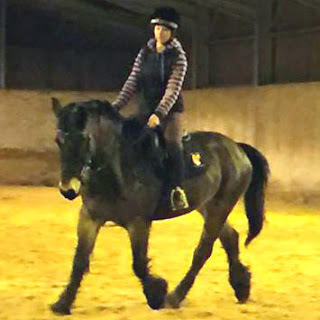 When I purchased her she was in good condition and had been ridden for the last few years in a Solution Saddle. I initially looked into purchasing one when I bought her home but not ever having experienced treeless saddles I stuck with what I knew, a master saddler (visiting every 8-12 weeks to check fit) and good quality treed saddle. (previously only ridden in a Solution Saddle). I had various ‘issues’ with Haze. An inability to round and work correctly through her back caused over muscling under her neck and she developed a nasty habit of ‘tanking off’ wildly around the school. 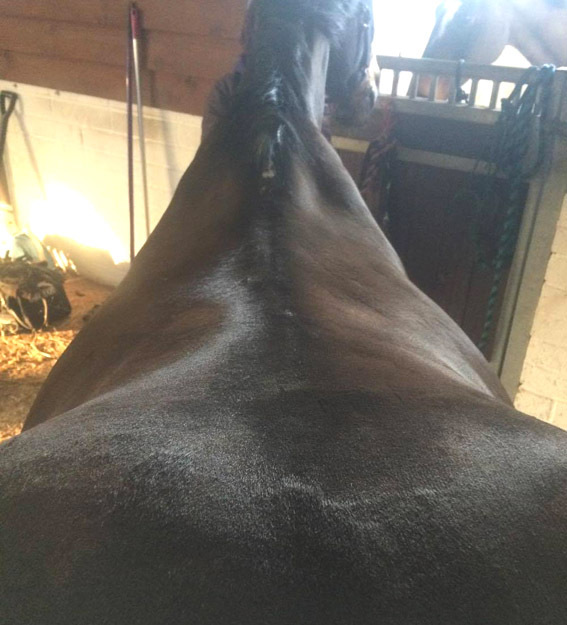 After 6 months of riding Haze the muscle atrophy where the saddle sat either side of her withers was horrifyingly obvious even to a non-professional. Putting the saddle on was a nightmare, she would move around and push me put of the way with her bum in what kind only be described as frenzied panic at times. (note the atrophy either side of her withers and the overdeveloped underside of her neck). I have now purchased a SMART Eventer saddle and even in the short space of a week a friend (who happens to be an equine physiotherapist) commented on how much better she is looking, less hollow and much softer. Encouragingly she stands still to be tacked up and, for the first time ever, stands calmly at the mounting block even allowing me to adjust the girth, an impossible task before. Riding her feels so completely different, it truly is like having a new pony. She is more responsive, in better balance and not running on the forehand. My only regret is that I put her through 6 months of discomfort before arriving at this point, if only I had known better! I am optimistic that the changes will continue to benefit both of us and things that seemed impossible before (such as going to clinics or competing) now feel a much more realistic goal. I am so excited about our future together.